The playing is both fluent and sensitively shaped. Ondine is proud to present the latest release of violist David Aaron Carpenter, "the hottest violist of the 21st century" (Norman Lebrecht), and "stunningly talented" (The New Yorker). Dreamtime features the titular solo viola work by Robert Mann (1920), founding member of the Juillard String Quartet and its first violinist for 52 years, as well as Frank Bridge's Lament. Frank Bridge (1879-1941) is one of the most outstanding composers for viola. The longest work on the disc is Brahms's Clarinet Quintet Op. 115 in the version for viola and string quartet. 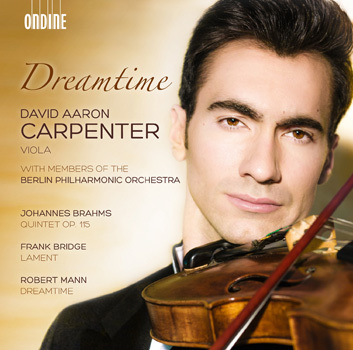 The starting point for this release was an invitation David Aaron Carpenter received from the Berlin Philharmonic Orchestra to perform a chamber music concert with some of their soloists. Brahms's Quintet and Bridge's Lament are live recording from this concert in February 2013. David Aaron Carpenter was featured on the cover of The Strad magazine in August 2013 and, a few months earlier, was the subject of a three-page article in the New York Times. He is thrilled to release this latest recording with members of the Berlin Philharmonic Orchestra. "Making music with these incredible musicians," he says, "has been one of the inspiring highlights of my career." David Aaron Carpenter's first recording, released in 2009 and featuring his own viola arrangement of the Elgar Cello Concerto (after Lionel Tertis) and the Schnittke concerto with Eschenbach was an international success, winning the coveted ‘Editor's Choice' accolade from Gramophone. Further releases on Ondine include Berlioz's Harold in Italy and Paganini's Sonata per la Grand Viola with Vladimir Ashkenazy and the Helsinki Philharmonic Orchestra as well as a world premiere recording of the recently rediscovered Viola Concertos of "the Swedish Mozart" Joseph Martin Kraus.